After buying a house purchasing a car is probably the most expensive thing you are going to buy. Of course the problem with cars as well is that unlike houses they depreciate in value. As soon as you drive them off the forecourt they are worth less than what you have just paid out for them. This gives an added importance to your choice. Some people like to change their cars every three years or less whilst others will keep a car until it dies. However long you plan to keep your car for one thing that can be tricky is the actual buying process. Whether you are buying a brand new car or going for a second-hand one the price you see on the windscreen or in the brochure is rarely the one you pay. If you're trading in your old car you need to have an accurate idea of how much your car is actually worth. Will you be buying the new car for cash or using a finance arrangement? Don't forget as well to think about the different types of insurance available for cars on top of the compulsory driver's insurance. I don't think I've ever been less than three hours in a car showroom when buying a car. It really is quite an agonizing process! To take some of the stress out of car buying and to make sure you make the right decision take some tips from today's guest post. “Our cars are one of the most – if not the most – important purchase we make. They get us from A to B and are vital for our work and leisure time. Many of us will be planning to buy a new car in 2016, a fresh set of wheels to perform this most vital of functions. Whether you're planning on passing your driving test and heading out on the road for the first time or you're ready to upgrade your existing wheels, some factors are important for any purchase. 1) Compare prices – It is easy to get carried away when you see a sparkly, clean new car in a showroom where you are being spoilt by staff with complimentary drinks. But don't make a rash decision that you regret the second you get home. Before visiting car dealers check out the average price of your desired new vehicle. This will give you lots of negotiating power with the seller and could help you avoid over-paying for a car that you could get elsewhere at a cheaper price. Always set a budget before you make any offers. 2) Car insurance cost – Once you've thought carefully about the car that you want to get and you've set your budget, you’ll need to consider the on-going costs of owning the car. The biggest expense is car insurance and sometimes, especially for younger drivers, this can cost more than the actual vehicle itself. There are many comparison websites out there to check for prices once you have a few basic details about the car you're looking at. 3) V5C registration document – The V5C document is the vehicle's registration paper or 'log book' and this will tell you who the registered keeper is. Be aware though that this doesn't make them the legal owner of the vehicle. Check the name of the person selling the car and if it doesn't match then start asking questions. Who is the keeper? Do they know that you are selling their car? The document must contain the keeper's contact details so there should be no excuses for you not being able to get these answers. Be careful and inquisitive to avoid making mistakes when buying a car. 4) Check the car in good light – Visiting the showroom or the seller on a grey, dark, wet day or even at night-time could end in disaster. You will need to see all of the car's imperfections in good light (preferably on a sunny day). If the seller hasn’t cleaned the car very well they may be trying to hide things like scratches, dents and other problems. 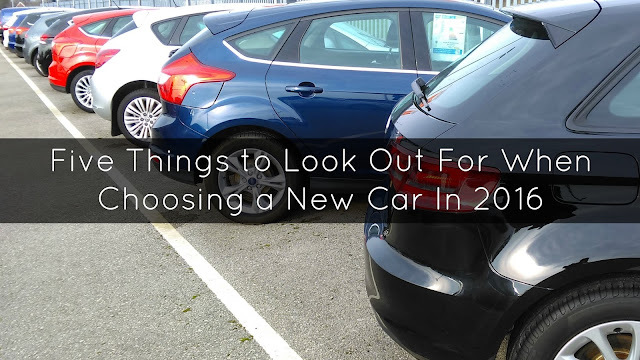 Are you planning on buying a new car this year? Do you find it a stressful process? Helpful, I'll be saving this for later! Great tips ... I could have done with this last year when we were looking for a new car! Great advice! I bought my car last year and I found that even calling/ visiting different branches of the same chain would get the prove down as they could see what their colleagues have quoted us! ! Some great tips! Car insurance and tax is always a main feature for us when choosing a car! We've been stung before! Great tips, I don't actually drive, but I'm learning! I am currently taking lessons with the view to pass this year. We'll be looking at buying a car then. I'll be taking my dad with me when I do as I have no idea about anythibg car related.